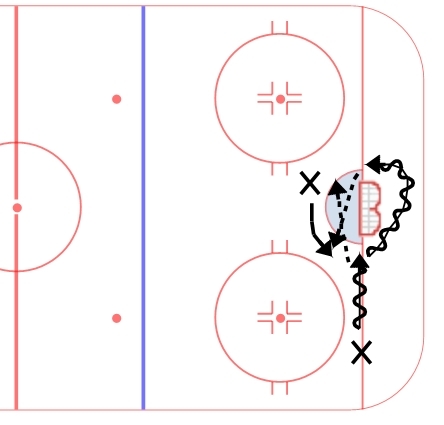 This week I am featuring a drill that I do with my goaltenders at Colby. I call it the Jam/Stuff drill. This drill works on a goaltender’s ability to play pucks along the goal line, behind the net, and in tight on the crease. It starts with a player attacking the net along the goal line. There is a second player positioned at the far post, right on top of the blue paint. The player with the puck attacks the net and then has a choice of whether to jam it tight to the near post, pass it across the crease for a re-direct, or go behind the net and again, jam it tight or pass across the crease (other player moves far post). In the event of a cross ice pass, the player should attempt to redirect the puck on net and try to keep it low, not handle it or catch and shoot. This drill will test a goaltenders ability to read the play, play pucks beneath the goal line and seal the ice. Goalies should focus on playing tight to the near post (this is where I would advocate for the use of the Vertical/Horizontal save), having an active stick to play passes, and sealing the ice with their pads. Hands should be active and out in front at all times. Understanding a player’s options as he moves behind the net is critical. Read the player moving behind the cage, understand when he is looking to wrap vs when he is looking to pass (depth is a good guide – players looking to wrap stay tight while those looking to pass tend to create space for themselves). Goalies will also have the opportunity to play second chance pucks in tight after the jam or in tight shot. Battling and competing for pucks is critical here. Good drill. And I understand how the “vertical/Horizontal” can be effective here. But what do you tell the young goalie who doesn’t execute that style effectively? They see it everywhere and want to implement it. But the way they use it, they are vulnerable. They go into it too soon, they leave holes within themselves, and they stay in it too long when puck comes out on other side, not tight but on a decent angle. I try to teach this as a “system” rather than a series of individual parts. They have to understand the entire “system” to use it well. I think when I am critical of a goalie who is not strong with this, I am accused of being “old fashioned.” It’s not the system I criticize but those who don’t use it properly. For them, it leaves them vulnerable. Thanks for the insight Joe. I agree with your points. You have to understand when it is effective and when it is not. When you say system, I see that as understanding the entire play. For me, the V/H method is effective when a shooter is at the bottom of the circles or lower and the net front is in an even man situation. Once the shooter moves below the goal line the goaltender needs to recover up and play it as he would a puck behind the net. Personally, I believe that young goalies shouldn’t use the V/H save often, if at all. The save itself is one built upon size and a blocking technique. It works well at the college level and the pro level because goalies have big bodies and big equipment. When an NHL goaltender uses it, there are very few, if any, holes in his play. Younger goalies do not have the size and usually lack the rebound control ability of their older peers. For this reason, I would teach to focus more on the puck and making the save than understanding and learning the V/H. For me, the V/H is a blocking style that is as much of a deterrent as it is a save (a very advanced technical aspect of the game) – goalies use it to take up all of the net when the shooter has a very limited angle. With young players, it opens more holes than it closes. Generally speaking, and especially in this case, my thought with young goalies is to teach them the fundamentals of the position (skating, save selection, rebound control) and get them to focus on making saves and battling for pucks vs being technically sound and “following the manual”. My feeling is that this will develop goaltenders who will be strong competitors and players, learning the technical side of the game as they grow and develop.